After 65+ age the life have changed for everyone and experience some problem regarding decline in their mental faculties and in visions and with health too. At this age elders could not be able to take care themselves and hurt themselves unintentionally. We should know about their safety. 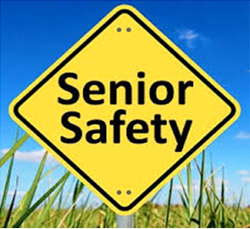 Old Age Solution describes all safety tips regarding for senior. 1- Home Safety for seniors. Remove obstacles in the house that could cause trip. Install lights on the stairs with light switch at the top of the stairs and at the bottom of the stairs. Install handrail at the stairs. Put non-slipper mats in the bathroom on the shower and on the floors. Install bar in the bathroom, around the toilet and the tub to hold. Paint your doors with a different and highlighting colour to avoid tripping. Put on hip pads for high risk of falls. Visit doctor and checked vision often. If you are not able to stand properly then do exercise on chair. Make the big number plate for home for better visibility from the street and do the same inside the home so elder’s people can read it. Give the keys to only trusty neighbours when you leave home. Make sure all doors are locked when you are busy with your work and your beloved seniors with you at home. Tell elders does not open door for anyone expect us. If elder wants to use phone help them. Don’t tell anyone that you’re elder alone at home. Don’t let them think that they are alone. Turn on a radio or television in another room to give the impression that someone else is around. Install the smoke detector in all rooms and check often. Do not let then wear loose clothes that can cause of falling and fabric while they are cooking. Put the switches at the entrances. All the electric wires should be fixing properly and not be open from anywhere.